The webbed claw is finished – it’s a little more ‘Innsmouth degeneration’, than ‘dragon’s claw’, admittedly. Pattern reproduced below, or alternatively, available as a PDF download, via ravelry. Errata – Cast on originally given as 32 sts, now corrected to 28 sts. Yarn shown here is the same as that used for the Cthulhuclava/Dracoclava – an acrylic/wool blend in an aran weight (Wendy Aran With Wool). Any aran weight yarn that gives the right gauge can be substituted. With 4mm DPNs, cast on 28 stitches. Join, taking care not to twist, and work 3×1 rib for 7 rows. Work stocking stitch for 17 rows. Next: (k4, m1) to end (35 sts). Next: (k7, m1) to end (40 sts). Work stocking stitch for 7 rows. Next: (k8, m1) to end (45 sts). Work stocking stitch for 4 rows. Next: (k9, m1) to end (50 sts). Place stitches on stitch holders. Take first five and last five stitches, and place on 4mm DPNs. Rejoin yarn and knit 3 rows. Next: k3; (k2tog) x2; k2; k3. Next: k2; (k2tog) x2; k2. Place remaining 40 stitches on DPNs. Rejoin yarn and knit round, picking up one stitch either side of thumb to close holes (42 sts). Place first sixteen and last sixteen stitches on stitch holder. Place remaining 10 sts on DPNs; rejoin yarn and knit 4 rows. Next: k2tog; k6; k2tog (8 sts). Next: k2tog; k4; k2tog (6 sts). Place 32 stitches back on DPNs. k16; pick up stitch either side of little finger; k16 (34 stitches). Place first 11 and last 11 stitches on stitch holders, and 12 at end (for ring finger) onto DPNs. Rejoin yarn and knit 6 rows. k5; k2tog; k4; k2tog (10 sts). k4; k2tog; k3; k2tog (8 sts). k3; k2tog; k2; k2tog (6 sts). k2; k2tog; k1; k2tog (4 sts). Place 22sts back on DPNs. Join yarn. k11; pick up 2 either side of ring finger; k11 (24 sts). Place first 6 and last 6 stitches onto DPNs and save middle 12 on stitch holder. Attach yarn at last 12 sts. Knit round; pick up 2 sts either side of of index finger (14 sts). K6; k2tog; k5; k2tog (12sts). These instructions are for both left and right gloves. 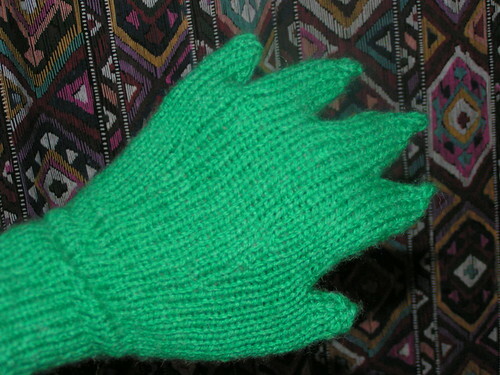 Finished glove will fit from a child age 10+ up to a medium adult size. This pattern is free for personal use, and not to be used or knit for resale or profit. 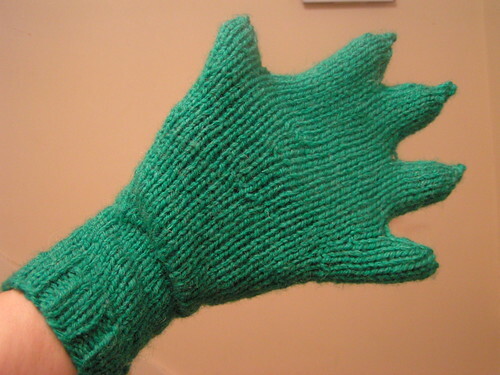 These should be warmer than regular gloves, since the fingers and thumb are not in separate little compartments. I’ll have to make this along with the Dracoclava! Love the pattern… tried 3 times to get the fingers… not doing well, what am I doing wrong…? The pattern really does not say to stay within a certain perimeter for every time you do a finger, so I’m confused. Can help? Thank you.